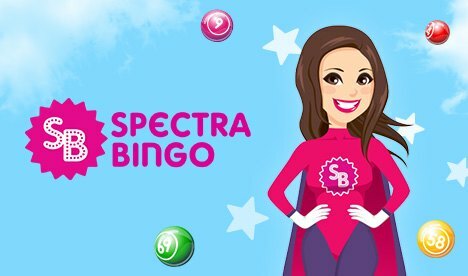 Spectra Bingo | Best Bingo Games Online | Join today! You can begin your bingo career at Spectra Bingo for free by taking advantage of this brilliant bingo site's offer of a 100% matched first deposit bonus, up to a limit of £100. This is just one of the many repeated promotions this site regularly gives to its members. Once you join, just keep one eye on the promotions page to see what wonderful deals are on offer! Jackpots : £1,000,000 - A new Spectra Millionaire is born every day! Twice a week at Spectra Bingo there's a generous jackpot game to join with an amazing top prize of £1million! Each of these games has a guaranteed jackpot (£1,000 on Wednesdays and £1,500 on Fridays) that simply has to be won. You can play solo versions of the popular 90-ball and 75-ball variations of game, or team up with a couple of your friends to play 'team bingo' with the potential of winning one million loyalty points. One of the key benefits of becoming a player at Spectra Bingo is that you automatically gain entry into the Bingo Friends Forever loyalty scheme. You add loyalty points to your account simply by playing bingo and having fun! The more points you gain, the higher up the scheme you climb. You can double your points by playing during 'Happy Hour', which actually lasts two hours, every Monday from 4pm to 6pm. You can also join the 'Nifty Ninety' room at this time and play in a pub quiz competition about all the latest celebrity gossip. You can keep in touch with all the last bingo news on the Spectra Bingo site by reading the regular newsletter. One thing you'll read about is the £6,000-worth of free cash games that take place every day, between 7am and 7pm. You can take part in these games even if you've no cash in your account, and you've the chance of winning real money. If you do have money in your account you can join the free games from 4pm with the chance of winning £10 in every game! If you like to take the odd break from bingo, and you enjoy playing online slots, then at Spectra Bingo you're definitely catered for. You can play some of the best slots games around, including many designed around your favourite TV shows both past and present, such as The X-Factor, Wheel of Fortune, Blankety Blank and Sale of the Century. These games have multiple winning lines, bonus features, chances to win free spins and some whopping jackpots!